Dialing a call with a keypad is an obvious first skill for you to acquire, and it’s dead simple. 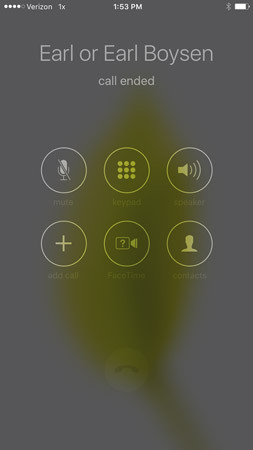 If your iPhone is equipped with iOS 9, there is also a new feature you can use to make calls called Car Play. On any Home screen, tap Phone in the Dock, and the app opens; tap the keypad button at the bottom of the screen, and the keypad appears. 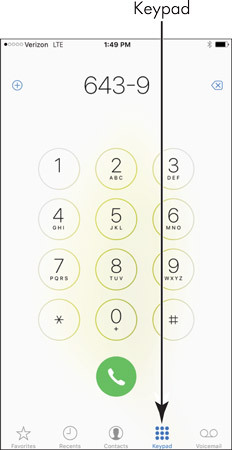 Enter the number you want to call by tapping the number buttons; as you do, the number appears above the keypad. If you enter a number incorrectly, use the Delete button that appears on the keypad after you’ve begun to enter a number (a backward-pointing arrow with an X in it) to clear numbers one at a time. Tap the Call button shaped like a telephone headset. The call is placed and tools appear. When you enter a phone number, before you place the call, you can tap Add to Contacts (the + symbol to the left of the phone number) to add the person to your Contacts app. You can create a new contact or add the phone number to an existing contact using this feature. If you’re on a call that requires you to punch in numbers or symbols such as a pound sign, tap the Keypad button on the tools that appear during a call to display the keypad. Car Play is a feature new with iOS 9 that provides the ability to interact with your car and place calls using Siri voice commands and your iPhone. Apps designed for Car Play allow you to interact with controls while avoiding taking your attention from the road. At the time of this writing, car manufacturers are in the process of producing cars that can take advantage of Car Play.